THE percentage of children achieving key literacy and numeracy targets in Northern Ireland’s post-primary schools varies widely with less than a third of pupils achieving expected levels in some non-grammars, The Detail can reveal today. Using data provided by the Department of Education, we tracked the academic achievements of 22,700 schoolchildren as they progressed through their post-primary education in Northern Ireland. Our investigation examined the pupils’ Primary 7 assessment results in literacy and numeracy, the outcome of further assessment at the end of Year 10 (their 3rd year in post-primary) and, finally, the same pupils’ GCSE results in 2013. Using Freedom of Information legislation, we requested and received statistics for 195 schools – 64 grammars and 131 non-grammars. Other schools have opened since 2008 and some others did not provide assessment results to the department. The figures for all of the schools are available in the interactive map above. All of the data we analysed relates to the group of pupils who took up Year 8 places in post-primary schools in 2008. There were 22,690 children at the start of our sample – this grew to 22,722 pupils sitting GCSEs at the end of Year 12 in 2013. While the results we examined relate to the same year group, the cohort within each school may not necessarily be exactly the same as the data is not tracked on an individual pupil basis. A decline over time of students achieving the expected levels of performance in English and/or maths in many non-grammar schools. 4,865 pupils did not achieve the expected Level 4 standard in English at the end of their primary school education and 4,445 failed to achieve the same expected standard in Maths. There is likely to be overlap with individual pupils failing to achieve both the literacy and numeracy target. Over 9,080 pupils did not achieve five or more GCSEs at grade A*-C or equivalent, including English and maths, in the summer of 2013. This is regarded to be the minimum qualifications needed to progress to sixth form studies at school, further education, training or into employment. In some individual schools, there was a dramatic drop in the percentage of pupils achieving the expected standard in English and Maths between the end of primary school and Year 10 (when Level 5 is expected to be achieved), while others showed improvement in both subjects or improvement in one and decline in another. The mixed results continue when it gets to GCSE level. Unsurprisingly, in the grammar schools a high percentage of pupils achieved the expected level across all assessment units. These schools use academic selection to admit pupils to Year 8. Professor Tony Gallagher, Professor of Education and former Head of the School of Education at Queen’s University Belfast, also examined our data and said that it showed the “significant challenges facing secondary schools”. Professor Gallagher said the figures for non-grammars show the levels of inequality in outcomes widening as school progresses and the relationships between outcomes and social disadvantage getting slightly worse. However, teachers’ representative Mark Langhammer, director of the Association of Teachers and Lecturers, instead described the Key Stage assessment process as “fatally flawed” and said the data cannot be relied upon. “Key Stage Assessments are part of an over-wrought government obsession with micro-accountability," he said. “What the Minister and department need to get is that you can’t fatten a pig by continually weighing it. Too many assessments get in the way of the learning process." We posed a series of questions to Education Minister John O’Dowd and received an extensive 1,300 word response. To read this in full, click on the link below this article. He said: “It is important to recognise that no one within the education system makes judgments about schools on the basis of bald key-stage assessment or examinations data. “The lower achievement described in the report is consistent with levels of poverty, a lack of social mobility and a pattern of educational inequality. In response to Mr Langhammer’s claims that the assessment data cannot be relied upon, Mr O’Dowd said: “This isn’t an artificial process. I want the assessment of our children to be based on the teacher’s own judgment – not on the bald results of a test pulled out of context. The table above shows how the various school types performed over the six year period. Our findings support a report by the Northern Ireland Audit Office focusing on literacy and numeracy which was published in February 2013. It stated: “The wide gap between the highest and lowest achieving children continues to be challenging with a strong correlation between low levels of academic achievement and free school meal entitlement (an indicator of social deprivation). There are further disparities in pupil achievement according to gender, residency and religion. “As pupils progress from primary to post-primary, the percentage of pupils reaching the expected standard in literacy and numeracy declines. Poor reading standards have dogged Northern Ireland for decades and have led to the disturbing and long-standing statistic that a quarter of adults here lack basic literacy and numeracy skills. These people may struggle to read instructions on a medicine bottle or to help their children with their homework. Overall, the percentage of pupils achieving expected levels in Maths went down in 83 of the 131 non-grammar schools between the end of primary (end of Key Stage 2) and the third year of post-primary (end of Key Stage 3). English went down in 66 of the schools between the two assessment stages. Among the largest recorded declines were the results for Ballee Community High in Ballymena. At this school, the percentage of pupils achieving the expected level in English dropped from 57% at KS2 to 22% at KS3. Maths went from 55% down to 13% at KS3. The Department of Education stepped in with its Formal Intervention school improvement programme at Ballee but the school eventually closed at the end of August this year. Only 13% of the pupils achieved five or more GCSEs at A*-C including English and Maths in last summer’s exams. St John’s Business and Enterprise College in Omagh had the largest percentage increase in Maths – from 50% of its 28 Year 8 pupils achieving the expected level at their primary school to 71% at the end of KS3. The percentage of pupils achieving the expected English standard also improved from 54% to 81%. At GCSE, 42% of the students went on to achieve the key benchmark of 5 or more GCSEs A*-C including English and Maths. St John’s principal Christine Doherty said: “We are pleased to be recognised for our achievements in Maths and English. The results in these subjects are central to our success and are increasingly important in the demanding post-16 environment. “We will continue to strive for all pupils to attain the required standards in GCSE English and Maths. “At GCSE, we use both a mentoring programme and an intervention strategy. “Each pupil is assigned a mentor (a teacher), whom they report to on several occasions during the week. This allows for continual monitoring of students’ progress. “If it is determined that certain pupils need further assistance, we can quickly target the areas where they are struggling and address any outstanding issues. We also offer after-school revision classes throughout Years 11 and 12 as students approach their exams. 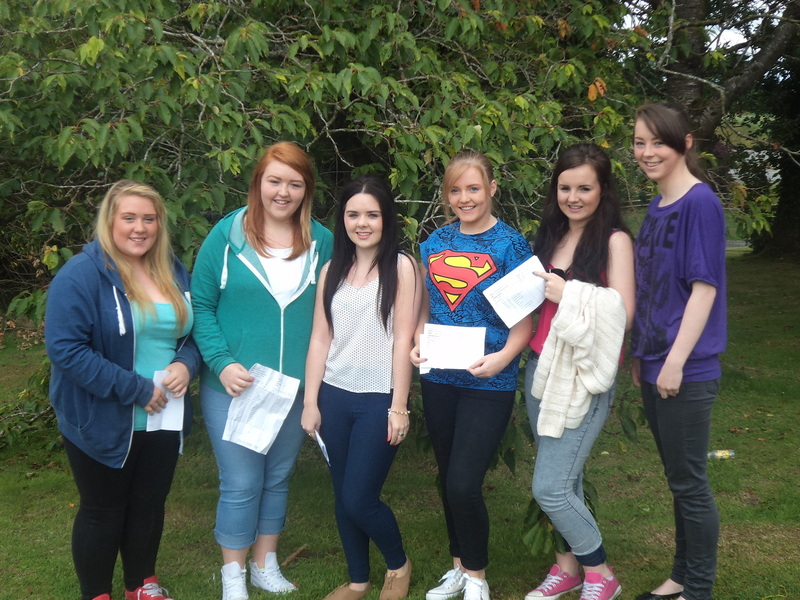 Integrated College Dungannon had a dramatic drop in achievement in both subjects. The percentage of pupils achieving the expected standard in English dropped from 78% to 35% in English and 78% to 39% in Maths between KS2 and KS3. In 2013 38% achieved the GCSE benchmark of 5+ GCSEs A*-C including English and Maths. Integrated College did not want to comment on its figures. At St Catherine’s College in Armagh the percentage of pupils achieving the expected standard in English increased from 85% at Key Stage 2 to 96% at the end of Key Stage 3. Maths went down from 82% but remained high at 81%. At this school a very high 72% of pupils went on to achieve the key five GCSE benchmark. St Catherine’s principal Deirdre McDonald said: “We were delighted with our pupils’ 2013 GCSE results and the August 2014 results significantly surpass these figures. “For many years the focus on literacy has been central to our school development and curricular planning and underpins all teaching and learning. In more recent years, the focus has also been on building confidence in numeracy. “Pupils’ literacy and numeracy skills have improved through interventions such as funding from the Neighbourhood Renewal Programme for our Homework Club, The Signature Project which provides extra staff for literacy and numeracy support, collaboration with primary schools and focused sessions for pupils with significant difficulties. As a result of academic selection being used to determine Year 8 entry, the grammar schools are well ahead of the non-grammars when it comes to their pupils’ achievement in Key Stage 2 assessments carried out by their primary schools. Thirty-three of the 64 grammars had 100% of their pupils at the expected level in KS2 and KS3 English and 36 schools in Maths (KS2 and 3). The lowest KS2 English rate was for the pupils at St Mary’s CBS (Glen Road Belfast) at a still very high 92% of pupils achieving the expected level. This dropped to 88% by KS3. At this school 23% of the pupils are entitled to free meals – the highest among the grammar schools. 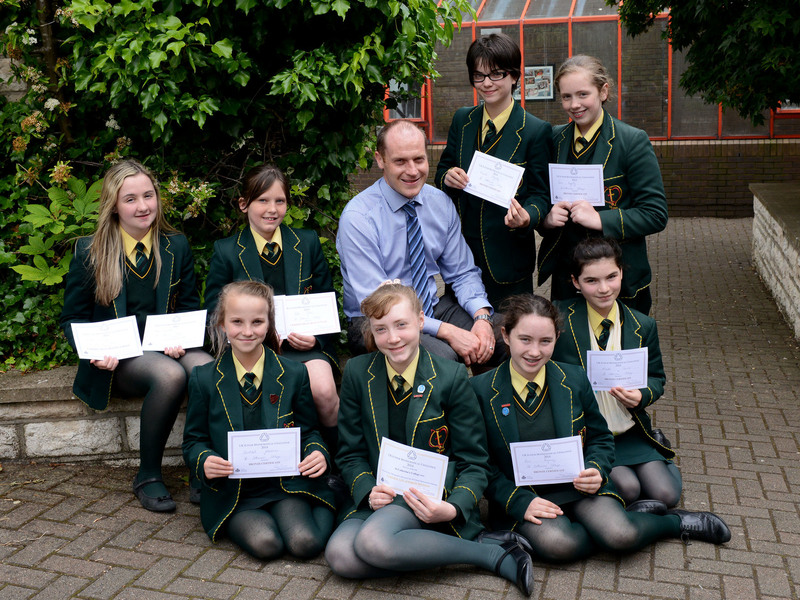 By the end of KS3, 97% of the pupils achieved the expected standard in Maths. Sixty-five percent of the Year 12 pupils achieved 7 or more GCSEs A*-C including English and Maths in 2013. St Mary’s principal Jim Sheerin said: “As you indicated, St Mary’s does have the highest pupil free school meal entitlement among grammar schools. Our free meal entitlement is 33% this year. By KS3, 100% of the pupils at Lumen Christi College in Derry had achieved the expected level in English and Maths and all of them went on to gain 7 or more GCSEs at grades A*-C including English and Maths. Of the 64 grammars, the percentage of pupils achieving the expected level declined in 15 schools for Maths and 5 for English between Key Stages 2 and 3. We asked Education Minister John O’Dowd what he thought of our key findings. “These findings are not new. I am familiar with the patterns described in the (Detail’s) report which, using the same information, were highlighted in the NI Audit Office’s report on literacy and numeracy. He stressed the impact of socio-economic factors saying: “International evidence and our own analysis points to the fact that concentrating deprivation in particular schools compounds the negative impact that deprivation has on pupils’ outcomes. Mr O’Dowd said he remains confident that “at a system level” the government targets set in 2011 for all pupils will be achieved. These targets state 90% of pupils should achieve the expected levels at KS2 by 2020, 85% at KS3 and 70% of all school leavers achieving key 5 GCSE benchmark, including English and Maths. Currently, in some schools, less than 30% of pupils are achieving the expected standard in key stage assessment. The Minister added that targets relating to pupils entitled to free meals “remain challenging”. And he referenced his department’s literacy and numeracy strategy “Count, Read, Succeed” which aims to raise standards and close achievement gaps. A key exam result target set in England is that at least 40% of pupils should achieve five or more GCSEs at grade A*-C, including English and maths. In the 2013 GCSE exams, 79 Northern Ireland schools fell below this English minimum “floor standard” target. 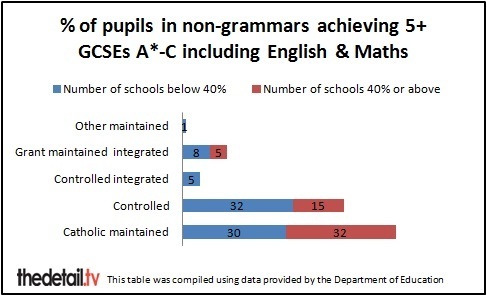 2013 GCSE performance of non-grammar pupils, excludes 3 schools where less than 5 pupils achieved this standard. Professor Tony Gallagher is Professor of Education and former Head of the School of Education at Queen’s University Belfast. He said: “Many teachers are sceptical about the validity of key stage assessment data, but for present purposes let’s take the data at face value, with department criteria for the expected level of performance at each stage. 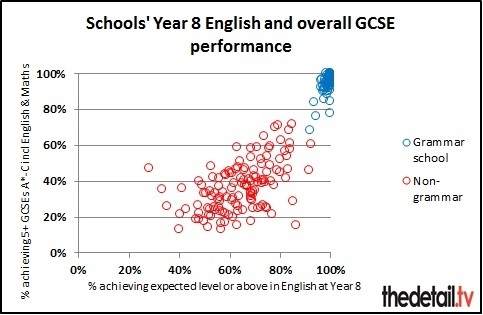 “The first most striking pattern in the data is the huge variability in assessed levels for pupils in secondary schools: on average about two-thirds have achieved expected levels at KS2, and little under two-thirds have achieved expected levels at KS3, but this drops to two-in-five achieving five or more good GCSEs including English and Maths, and only a third achieving seven or more good GCSEs including English and Maths. “These average levels disguise very wide differences across the secondary schools, with the levels of inequality in outcomes widening as school progresses and the relationships between outcomes and social disadvantage getting slightly worse. “There is also a highly variable pattern in the relationship between KS2 and KS3 data, and between KS3 and GCSE outcomes. 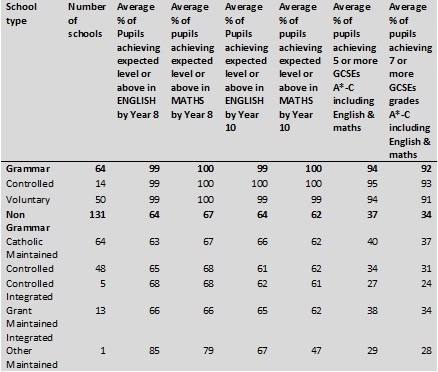 Among the secondary schools there are some where the achieved levels for KS3 are higher than KS2 (for both English and Maths), but there are more where the achieved levels for KS3 are lower than for KS2, and there appear to be more in that latter group when the KS2 achieved levels are low. “The patterns for controlled, maintained and integrated secondary schools are broadly similar, although the level of decline in expected levels of performance is higher for controlled schools. “By contrast, virtually all of the pupils in grammar schools achieve expected levels at KS2 and KS3, although there is a degree of variation in the proportions achieving five or seven good GCSEs including English and Maths as a few grammar schools show a much lower level of performance than their peers. “These data, particularly the high degree of inequality of outcomes at KS2 and, especially, KS3, highlights the significant challenges facing secondary schools. If the data are an accurate measure of the schools capacity to meet those challenges, the data also suggest they are finding it difficult to maintain improvement. Mark Langhammer, director of the Association of Teachers and Lecturers in Northern Ireland, strongly questioned the reliability of the assessment data. He said: “The Key Stage Assessment process is fatally flawed and the data cannot be relied upon. “Independent surveys have shown that teachers place little value on KS assessment as a means of informing teaching and learning. “By making KS assessment a high-stakes system accountability mechanism, it maximises ‘gaming’ the system and wrecks the primary purpose of informing teaching and learning. “What the Minister and department need to get is that you can’t fatten a pig by continually weighing it. Too many assessments get in the way of the learning process. “Key stage assessments are part of an over-wrought government obsession with micro-accountability. Note: KS2 data is unavailable for Strabane Academy and St Killian’s College as both schools opened after the 2008/09 academic year, and Craigavon Senior High School, Lurgan College, Portadown College and St Michael’s Grammar as these schools do not have year 8 pupils. KS2 data for Drumragh Integrated College, Sperrin Integrated College, St Brigid’s High School and St Joseph’s High School in Crossmaglen was not provided to the Department. There is also no KS2 data for Christian Brothers’ Secondary School in Belfast.